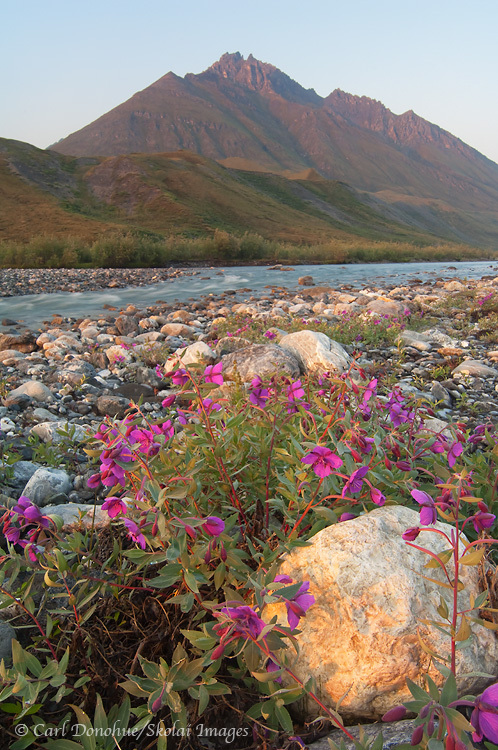 Photography and Icons | Landscape Photography and Art | Brooks Mountains photo, ANWR, Alaska. Dwarf fireweed (Epilobium latifolium) and the Upper Marsh Fork River of the Brooks mountain range, in the Arctic National Wildlife Refuge (ANWR), Alaska. Mid summer, this photo was taken about 2:00am. First light of the day. 🙂 Please click on the image above to view a larger version of the photo. Recently I’ve read a few articles and posts about photography and and photographers, and particularly landscape photographers; the question of ‘shooting icons’ almost invariably comes up. For those readers here who aren’t quite sure what that is a reference to, it simply points to the regularity with which so many famous landscapes are photographed. Scenes such as Grand Teton from the Snake River Overlook, Yellowstone National Park’s Lower Falls are almost ubiquitous with landscape photography. It’s an interesting discussion. Those kinds of locations are frequently photographed because not only are they spectacular scenes, but they’re also great to photograph; overlooks and viewpoints seemingly designed with the landscape photographer in mind. This is not true of all spectacular scenes, for a variety of reasons. The primary reason a scene like this one, of Mount Edith Cavell and Cavell Lake in Canada’s Jasper National Park has been photographed so many more times than, say, the scene at left, is that Edith Cavell is road accessible. All the other discourse about happiness and contentment and art versus stock and following one’s creative muse and shooting your passion is simply talk; it all comes down to the pavement. If it’s off the road, it’s probably not an icon. The question then concerns itself with the value of our pursuit; and that, like so many such questions, is entirely contextual. For some people, shooting photos that sell well is all that matters. For others, shooting photos that express some personal vision is more important. Those 2 quests are not always in alignment. All the contentment in the world is somewhat moot if there’s no food on the table come suppertime. And what of a nice fat check on the doorstep if it serves (and is served as) a function of misery? Perhaps what’s disappointing is not photographers shooting pictures of the Teton Range, but the absolute overwhelming pursuit of those photographs; literally hundreds of serious and very talented photographers shoot the same scene every month (as an aside, I know of just one photographer other than myself who has a shot of this same mountain, and he was standing bleary-eyed about 50′ away from me when I took this photo). It’s Wyoming’s version of combat fishing. There is simply no dispute over the grandeur of such a place, and the value of experiencing them; Niagara Falls, the Grand Canyon, Lake Louise (Banff National Park) and so forth are amazing places, with amazing scenery, and (almost) all of the elements in place for great nature photography. What I am dubious about, however, is the artistry involved in this ‘icon photography’. What room is there for creative expression at places so repetitively (and wonderfully) photographed? Recreating is a paltry proxy for creating; reassembly scant subsidy for making. Art is about making. Art is not about re-making. World-reknown thinker and self-avowed iconoclast Joseph Chilton Pearce wrote that “to live a creative life, we must lose our fear of being wrong” – this is, essentially, the art of creating. To create is, essentially, to speculate, to step into the unknown, to explore. Art is little more than the practice throwing mud at a wall and seeing what might stick. Exploring the unfamiliar requires facing that fear of being wrong, of tossing out marbles and finding out that nothing might stick. Similarly, Erich Fromme said that “creativity requires the courage to let go of certainties”. This advice is in conflict with the idea of a trip to Snake River Overlook or Antelope Canyon; on the contrary, most paparrazo head to these places precisely BECAUSE of the certainty, of knowing what comes next. I think this hounding of famous locales is also at odds, to some degree, with the intent of copyright law and the concept of intellectual property. Musicians, for example, must pay hefty royalty fees to cover another’s composition, regardless of how (often drastically) differently they may arrange the notes. Rolf Harris’ cacophonic version of Stairway to Heaven is a classic (though extraordinarily bad) example of how widely disparate a cover version may be from the original tune, yet the track still is not considered an original composition. John Fogarty, of Creedence Clearwater Revival, for example, was once sued by his (old) publishing company because they deemed a newer work of his to be too directly influenced by a tune he had written previously (they lost, but only because Mr. Fogarty convinced a judge the 2 pieces were not overly musically similar). Imagine if photographers were held to this standard for their creations. As artists, we must seek out the new; art is divergent from artifice. We learn from the past, from other artists, from an infinitely diverse assemblage of sources, but we mustn’t replicate them. We’re photographers, not xerox operatives. “A young painter who cannot liberate himself from the influence of past generations is digging his own grave” – Henri Matisse. No musician I know wants to make their living playing cover tunes. This entry was posted in Adventures, Alaska, ANWR, Art, Musings, Photography, Rafting and tagged ANWR, Arctic National Wildlife Refuge, Art, Brooks Mountains, Landscapes, scenics on November 17, 2010 by Carl D.
A good discussion, and certainly valid. It certainly explains the number of people heading to more obscure places in recent years. Iceland for example has become a real hot spot in more ways than one. I personally found an out from the icon trap by shooting them at night..
Photographing known subject can be a fruitful exercise for photographers, as they strive to bring new insight to a familiar scene. Seeking new material can be equally creative and exciting, showing places and points of view never ever seen before. These are not mutually exclusive approaches. We can do both at different times in our work. I think part of that, too, is simply that the world has become smaller. More people with more disposable income and increased ease with which to get around the world. Certainly, and there’s no argument that through shooting a subject over and over we can find new ways to see that subject, “better” conditions, etc, etc. However, the deep tripod holes at Oxbow Bend or Zion’s Subway seem to suggest that few are making a real attempt to bring “new insight” to those scenes. And I don’t buy the Oh, I shot it with a 18mm lens instead of the usual 24mm” argument as a step towards the creative. Secondly, I’ll beg to differ; the two ARE mutually exclusive, simply because I can’t be in the Tetons and in the Arctic National Wildlife Refuge at the same time. I wrote about that in another recent blog that might be of interest to you. Similarly, to position oneself for a backlit or sidelit shot, one has to forego shooting the classic frontlit look. Certainly, over the course of a lifetime, one can shoot many different subjects and many different styles. But we’re al creatures of habit, no? That is a sweet image Carl! You make a good point – road access sure greatly increases the likelihood of achieving iconic status, although there are a few exceptions such as the Subway in Zion. I will say, most iconic location are beautiful. All of the beautiful is not art, and all art need not be beautiful is what I take away from all of it. Some of the iconic images I liken to comparing a big studio produced album vs. listening to some guy play music on the street corner. Both may be magnificent, but perhaps the street corner requires a bit more careful attention to find the true inspirational parts.